I was just reminded by one of my Ticket King Milwaukee coworkers that we have 2010 Winter Olympics tickets available. When you are traveling to another country, albeit Canada, you want to feel good about the company you buy Olympics tickets from. Look no further than Ticket King Milwaukee. We have been helping people find the best Winter Olympics tickets for 17 years. 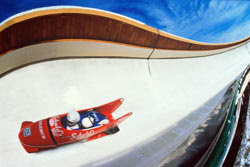 That means we have supplied customers for the past 10 (summer and winter) Olympic games. Winter or Summer, we're your source for tickets to any event. Some Winter Olympics tickets in Vancouver are harder to find than others. Calling early for tickets is your best bet, but we can have tickets ready on site if needed. We're members of the NATB and BBB.